05:20:00 Makes 20 servings, 1 bar (54 g) each. Makes 20 servings, 1 bar (54 g) each. 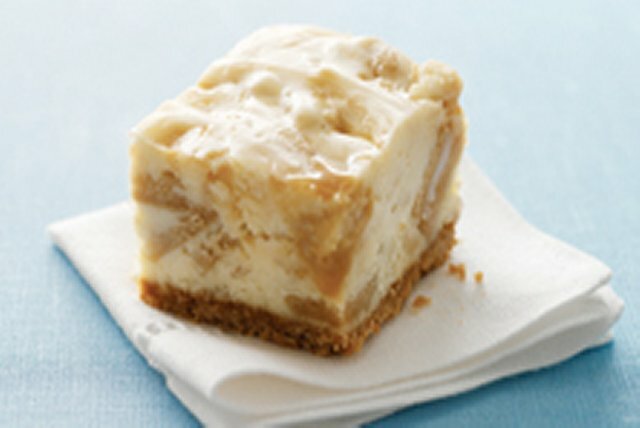 Ooey gooey caramel is a sweet addition to creamy cheesecake bars. Line 9-inch square pan with foil, with ends of foil extending over sides; spray with cooking spray. Process 14 cookies in food processor until finely crushed; mix with butter. Press onto bottom of prepared pan. Bake 10 min. or until golden brown. Cool 10 min. Meanwhile, microwave caramels and water in microwaveable bowl on HIGH 1 min. or until caramels are completely melted, stirring every 30 sec. Coarsely chop remaining cookies. Beat cream cheese and marshmallow creme in large bowl with mixer until well blended. Add egg; mix well. Stir in chopped cookies; pour over crust. Drop spoonfuls of caramel over batter; swirl gently with knife. Bake 20 to 25 min. or until centre is almost set. Cool completely. Refrigerate 4 hours. Use foil handles to lift cheesecake from pan before cutting into bars. Bars can be stored in refrigerator overnight before serving. Serving Size Makes 20 servings, 1 bar (54 g) each.